The inclusion of a flow control device in the inlet connection of the Goslyn™ Separator ensures the designed maximum flow rate cannot be exceeded and the Goslyn™ will not be overwhelmed by effluent surges. In practice, a cumulative surge event is very uncommon and merely results in a slower drain down time. For sizing specification therefore the cumulative total volumes of the sinks and equipment draining into a Goslyn™ is not critical in the determination of its required flow capacity. The desired time taken to empty the sinks etc becomes the determining factor together with the layout of the kitchen such as where the lines of above floor drainage are interrupted by circulation routes or the invert of the drain line becomes too low to enter the Goslyn™ . A further consideration is the desirability to reduce the length of the “at risk” drain lines, ie. to site the Goslyn™ as close to the sinks etc as practical and so minimize the risk of animal fats setting out in the drain line. All the pipe work upstream of the Goslyn™ may be considered as part of the “device collection system” rather than part of the “drainage system” It is not necessary to place any water traps upstream of the Goslyn™ as these lines will drain dry after each appliance is emptied out and no organics will be left to decay. However the outflow from the Goslyn™ must be protected by a water trap and the NPC rules for distances to stacks and venting will apply. It is important that the outflow from any Goslyn™ device has a pipe size of at least the same diameter as the outflow connection and there are no restrictions inserted. Extensive field testing in restaurant kitchen environments has shown that a Gos 40 (10gpm) will suffice to serve either, a rinse sink and dishwasher, or up to a three pot sink (3 compartment sink) without the drain down time becoming problematic for the kitchen staff. Similarly a Gos 80 (25gpm) will suffice for up to and including a rinse sink and dishwasher plus a three compartment sink Any extra effluent loads resulting from a Combi oven or rotisserie may be routed through either Goslyn™ without affecting performance. We recommend routing the sanitizing compartment (no FOG present) of a 3 comp sink to bypass the Goslyn™ to further reduce the drain down time if all three compartments are drained at once. In certain retrofit situations where the kitchen is on a second floor (or higher) it may be expedient to site the Goslyn™ on the floor below. In this case please contact our technical department for advice on flow control. 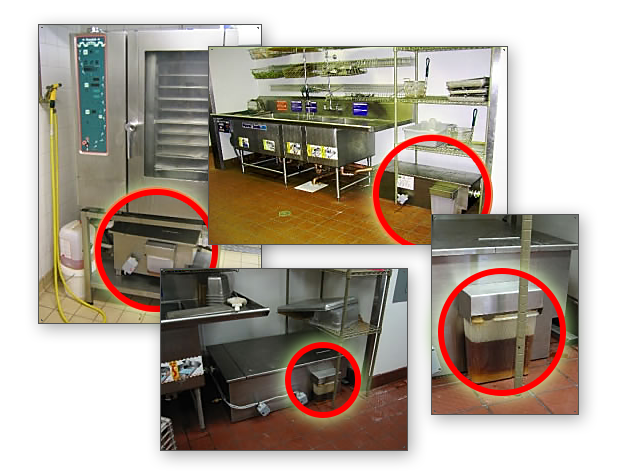 Independent studies have shown that 90% of the FOG load generated by a commercial kitchen is through the pot sinks, rinse sink and dishwasher and that the floor drain does not need to be intercepted. Any oil spills which may occur from time to time are better soaked up using an absorbent such as cat litter which can then be swept up and placed in the trash. If it is required to intercept the slop sink this may be raised up to a better ergonomic height and the mop bucket rim altered to give easy tipping without the user having to bend down. The slop sink drain may then be routed to the Goslyn™ so any FOG in the floor wash water may be removed. Where the drain line of a cooking appliance is routed to the Goslyn™ and is shared with wash sinks etc the cooker drain line is to enter shared line after the flow control device and via an air gap to prevent cross contamination. We recommend dishwasher connections to enter drain line down stream of the flow control valve in order that the timed outflow from the wash cycle is not impeded. The guide below lists the Goslyn™ models most likely to be used in a commercial kitchen. Larger sized Goslyns™ (50, 75, 100, 200 GPM and higher) are available for food processing facilities and industrial scale operations. Contact our design team with your situation and we will provide the optimum solution. Low profile unit for under sinks and where drain lines are low.